There's no rush for a hard border as far as the traders in Newry are concerned and that's not surprisng when you see the number of cars that are coming from the Republic. Individuals are spending between £200 and £900 each on alcohol, books, cat food, coffee and paracetamol when they get here and that could be up to four times a year. Gone are the traffic jams and mad queues for the car parks and you don't see too many signs saying £1 equals €1... but it's still a dual currency economy. Retired stockbroker Dermot Duffy (68), from Dalkey, who spent £290 on alcohol, said he usually does a Newry shop in the summer and at Christmas. "I always come for the drink; this lot would've cost me €500 at home so it's well worth the trip!" Dublin couple Monica Brooney, a homemaker, and civil engineer John Brooney, both aged 60, popped up for a three-hour shopping trip during which they shelled out £280. "We've mostly bought alcohol but we picked up some clothes too. The same items would've cost us €700 in the Republic so it makes good economic sense to come." Margo Connaghan (59), a carer from Drogheda, who has been coming up every three weeks for cheaper groceries for the last decade, spent £200 last Thursday. "I've saved a fortune on Purina cat food, Hellmans mayonnaise, coffee and toiletries," she said. "Yellowtail wine is just £7 a bottle here whereas it's €14 at home. "My mum Betty who's 91 loves her puzzle books and you can get them much cheaper here as well," she said. Accountants Rita Tracey (48) and Francis Donnelly (56), from Drogheda, said they were up for a look around. "We usually shop in Newry four or five times a year and spend a couple of hundred pounds a time," said Rita. "Books are good value for money. So is paracetomol - it costs me €9 for (48 tablets) of Iboprufen at home. I can't believe you can get three packets of paracetamol (16 tablets each) for £1 in Newry!" Hairdresser Leona Keegan (40), from Dublin, who started shopping at 9.30am was heading back home at 3pm having spent almost £200. "I'm here for Christmas gifts and toiletries," she said. "There's not much in it in terms of cost but it's only 50 minutes up the road and it's nice to go to Newry for a day out." Dubliner Megan O'Rourke (36), who is recently unemployed, said she'd spent over £100 on wine, clothes and perfume. "Apart from the alcohol, I'm not sure things are cheaper but I'm just here to shop somewhere different," she said. Waterstones manager John Fitzpatrick said the store, which is located in The Quays, has been busier than usual this year, with the majority of customers hailing from the Republic. "I'm told it's around 20% cheaper to buy books in Northern Ireland so we've really seen a big increase in the number of southern shoppers," he said. Dublin couple Therese and Ciaran Coughlan, who are both 64, said they were staying in the area for three nights while they do their Christmas shopping. "We went to The Bouvelard in Banbridge yesterday and now we're here for the day," said Therese, who's retired. "We expect to spend about £500." Husband Ciaran, who works in a bar, added: "We've been to Sainsbury's, Waterstones and Marks & Spencer and all I need now is to find a shop that sells tyres for my car." Shannon McMahon who works at the Ciara Daly make-up concession in Newry's Buttercrane shopping centre, said she'd heard a mixture of accents. "There are a lot of people from the Republic as well as loads from Belfast who've come here to get their Primark fix in the aftermath of the Belfast fire," she said. A-level business students at St Mary's College, Grace Cahill, Laura Grant and Sarah Kelly, all aged 17, were manning a bakery stall at Buttercrane as part of their Young Enterprise scheme. "We've made a lot of sales in euros today because there are so many southern shoppers at the minute," said Grace. "Our target is to reach £350 for charity and we're well on our way to that." 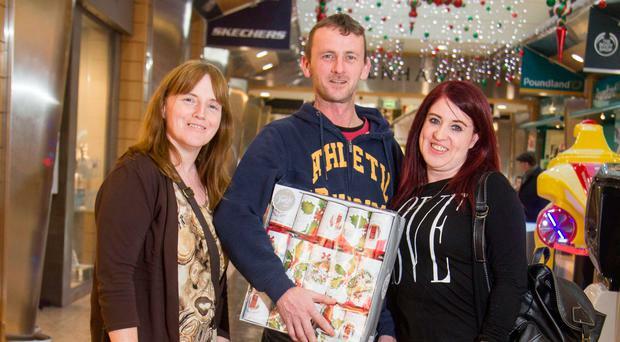 Friends Marie O'Connor (45), a waitress, delivery driver Gerard Hynes (41) and homemaker Sadie Broughall (49), from Portlaoise spent close to £1,000 between them. "Alcohol, hair straighteners and hairdryers are all better value so it makes good economical sense to shop here in the run up to Christmas," said Marie.